What Day Of The Week Is July 29? 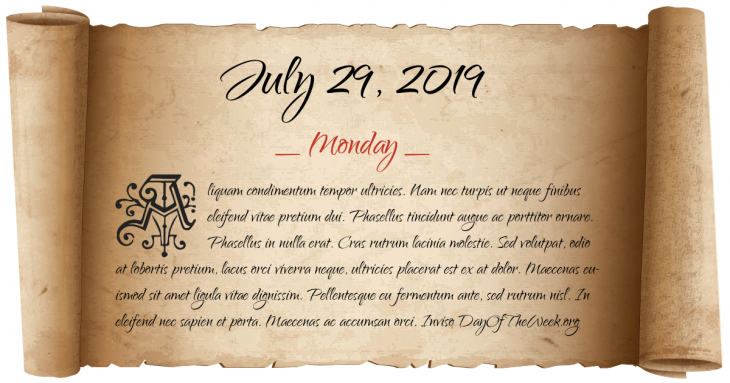 July 29, 2019 is the 210th day of the year 2019 in the Gregorian calendar. There are 155 days remaining until the end of the year. The day of the week is Monday. Byzantine-Bulgarian Wars: Battle of Kleidion – Byzantine emperor Basil II inflicts a decisive defeat on the Bulgarian army, and his subsequent treatment of 15,000 prisoners reportedly causes Tsar Samuil of Bulgaria to die of a heart attack less than three months later, on October 6. Irish Potato Famine: Tipperary Revolt – in Tipperary, an unsuccessful nationalist revolt against British rule is put down by police. Great Depression: in Washington, D.C., troops disperse the last of the “Bonus Army” of World War I veterans. The International Atomic Energy Agency is established. British Prime Minister Margaret Thatcher and President of France François Mitterrand sign the agreement to build a tunnel under the English Channel (Eurotunnel). The Israeli Supreme Court acquits alleged Nazi death camp guard John Demjanjuk of all charges and he is set free. Who were born on July 29?